So you have yawned your way through all those videos, posts and manuals about ovens, those tins, tools, ingredients. You got your oven. Now you just can't wait to bake in it! Who in their right minds wouldn't love an impossibly easy recipe which also gives delectable results as the first ever bake? Take it as just saying hello to your oven and actually doing all that preheating stuff blah, blah. No great list of ingredients, no fussy weighing, preparing pans, no nerve-racking tricky techniques. The best thing - this will be all done in 15 minutes flat. You can style the dessert and serve it feeling very Mastercheffy( I know there is no such word!). Then sit back and enjoy the compliments. 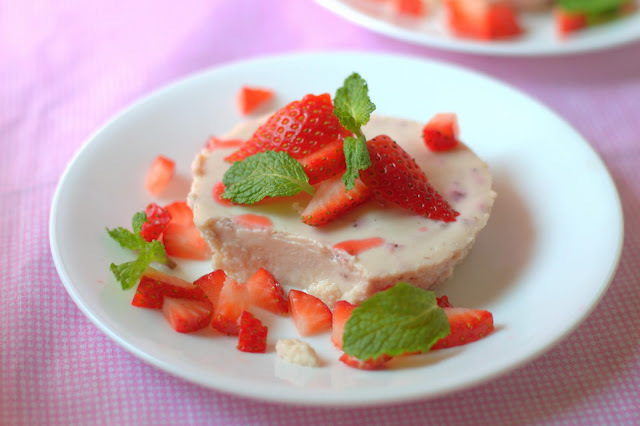 So let us call this the Unbelievably Easy Cheesecake with just 3-4 ingredients, no eggs. This may not be the 'real' cheesecake, but it is called one and tastes pretty good. You can play around with the recipe, flavor it as you please. This is a recipe everyone must know, as a dessert emergency knows no novice and veteran! Unbelievably Easy Yogurt Cheesecake. Based on Tarla Dalal's recipe. You can also watch my 90-second video of the recipe. Flavor variations - Stir into the cheesecake mixture 1 tablespoon thick strawberry puree/plum puree, orange/lime zest, saffron, cardamom, vanilla bean. Make sure the consistency of the mixture doesn't get diluted by the addition of the fruit puree or sauce. Serve it with a sauce which complements the flavor of the cheesecake. Place 4 small 120 ml/ 1/2 cup capacity tart tins( or 1 large tart tin) on a baking tray. Do not use tins with loose/removable bottoms. There is no need to grease or line the tins with baking parchment. Placing the tin on a tray makes it easier to keep in and remove the cheesecake out of the oven. Whisk together the condensed milk, yogurt, cornflour and vanilla extract, ensuring there are no lumps. Pour the cheesecake mixture into the tin up to till it reaches 3/4 way up. Bake for 8-10 minutes or until the cheesecake sets gently. If you touch the center of the cheesecake, it should feel firm and not liquidy at all. It will rise only slightly in the oven and settle down again. The baking time will vary if you would be using a tin of a different size. Do not overbake. Cover the cheesecake(still in the tin) with clingfilm and chill for at least 3-4 hours or overnight.Run a sharp knife around the edges of the cheesecake. Invert on a serving plate and tap to release it. The baked cheesecake can be stored in the refrigerator for 2 days. Go out for the strawberries and prepare the sauce while the cheesecake is chilling. Wash and hull the berries, chop them roughly. Take the berries and sugar in a heavy saucepan. Cook on low heat till they are mushy, about 5 minutes. Keep stirring in between. Smash with a fork. Add a tablespoon of water or so if needed. Cool and refrigerate. Blitz together all the ingredients, add more sugar/water to adjust the taste and consistency. 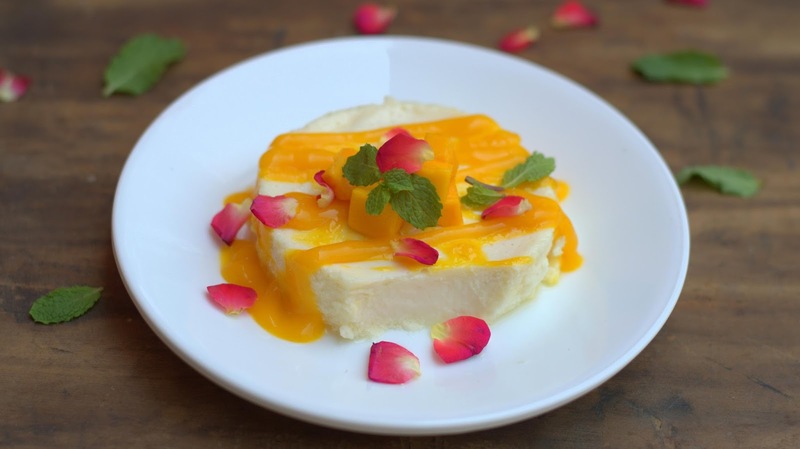 Serve the cheesecake topped with fresh strawberry /mango-rum/plum/cherry sauce. Be sure to have more sauce to pass around later. That is it! I can't think of a simpler recipe for anyone to try as the first bake. So if you have that can of condensed milk and yogurt, try this soon! And yes, please do leave your comments for me.